I don’t know about you guys but I say those are pretty good themes for me. But we do understand that not all the times you will go with the default themes we ship. You may want to customize it to your organizational or even project color combination. So we will see how we can do the customization in the coming section. Navigate to ThemeBuilder tool online. 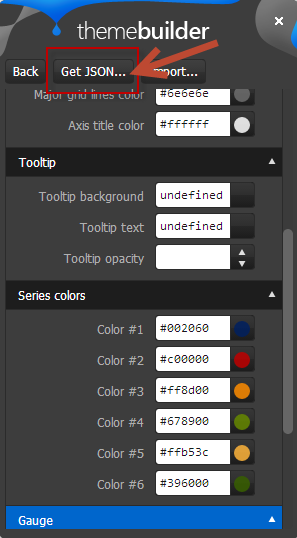 To start customization, you are required to first select one of the default themes. This is like a foundation to start the customization. So select any default theme first. 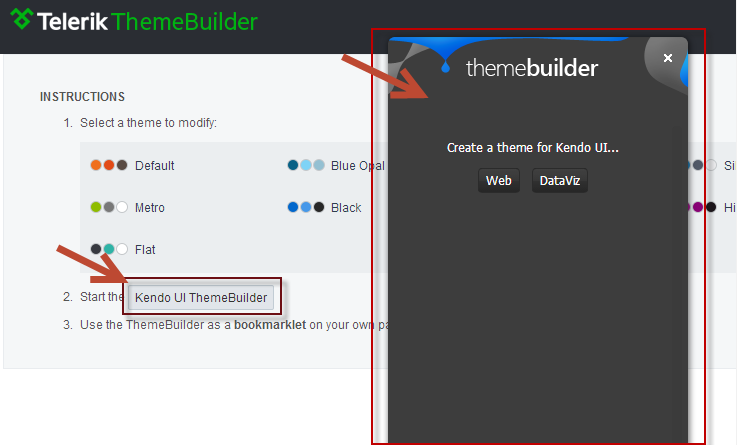 Next start the ThemeBuilder tool by clicking on the button named “Kendo UI ThemeBuilder”. This will launch the ThemeBuilder GUI tool and will appear on the right hand side of the page. Give it a couple seconds to load the GUI. 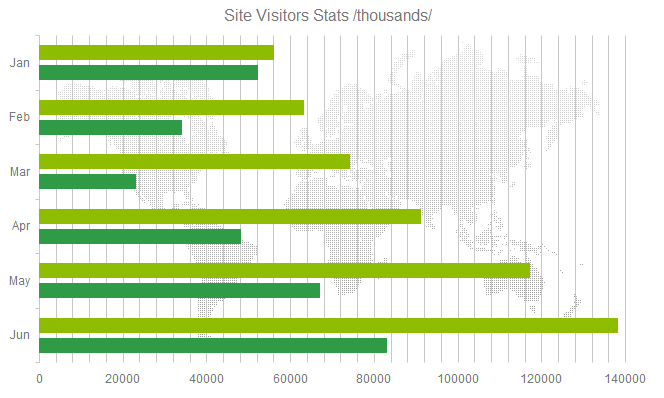 Since we want to customize the DataViz widgets, select the button labeled “DataViz” in the ThemeBuilder GUI tool. 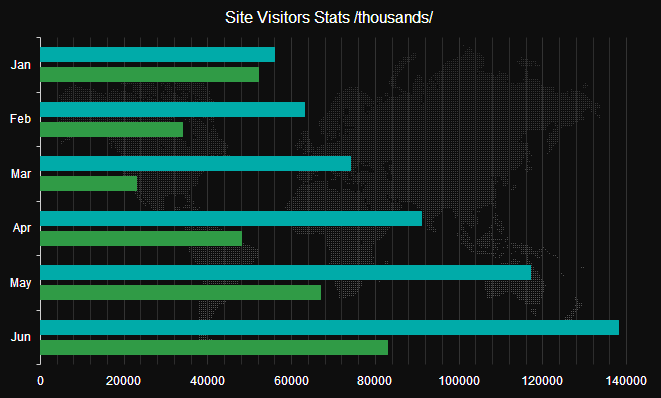 This will provide us with a UI which will help us to customize different aspects of the DataViz widgets. 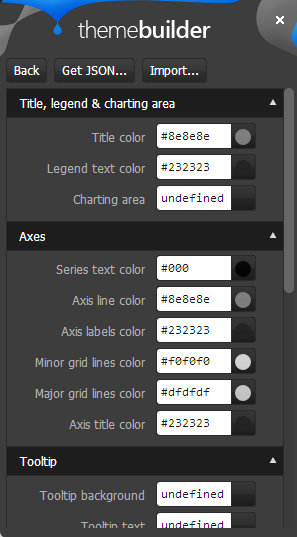 Like this you can set your custom colors for all the customization points available for the widget. Once you are done with your changes, click on the “Get JSON” button available on top of the GUI tool. 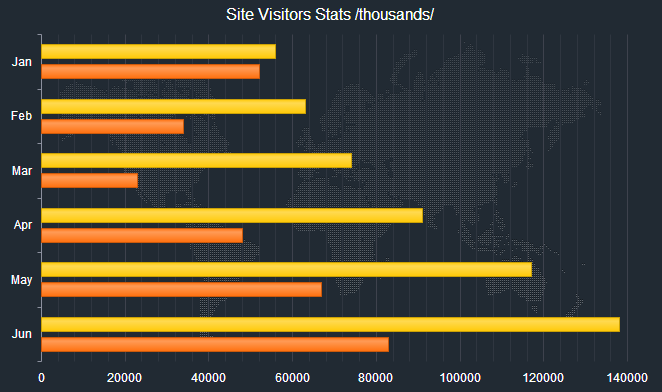 This will spit out a JSON structure of the changes you just did. 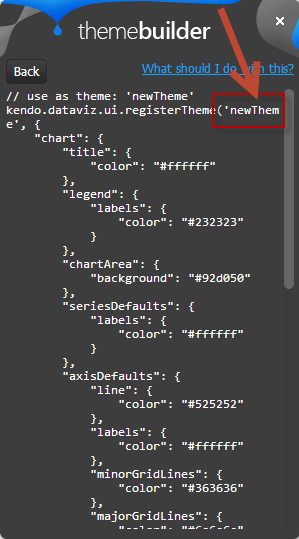 Notice that by default the custom code is named as “newTheme”. You can change that and provide your own custom name. Remember the name as this is the name you will use to set a theme on a DataViz widget. All we are doing is – we register this new theme with the DataViz ui and later when we set theme property of DataViz widgets to this custom theme name, Kendo UI will be able to apply your color schemes to the widgets. 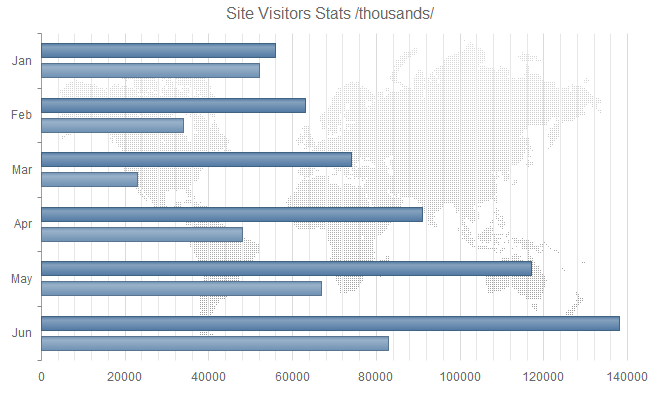 I have named my theme as “LohithTheme” and use that name while creating a chart. And that’s as easy as it can get to customize a DataViz theme. Hope this blog post helps you if you have a similar scenario of customizing our DataViz widgets. Do let us know your feedback on this blog post through the comments. Simple and clear as crystal. Can we use the same tool for customizing other KendoUI controls as well? 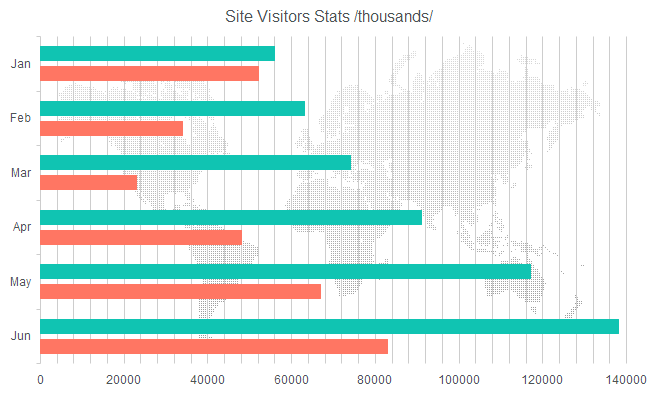 With the themebuilder showcased in this blog – we can do Web and DataViz. For web it will be a CSS or LESS file support which you can use in your projects. For Kendo UI Mobile we have a separate themebuilder.